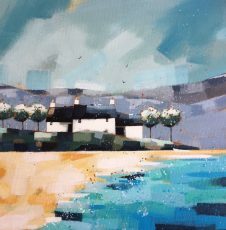 Artist Dionne Sievewright was born in Perth, Scotland. 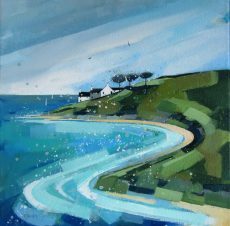 She graduated in 1997 from Duncan of Jordanstone College of Art and Design in Dundee with a degree in illustration and printmaking. She began her career in the design industry, working as a textile designer for fashion house Missoni. However, a move to the south west in 2001 gave Dionne the space to fulfill her dream of making a living as a full time painter. Dionne’s inspiration comes from her travels and the natural world around her. She starts on location with sketches in pencil and watercolour and then completes her work in her garden studio. 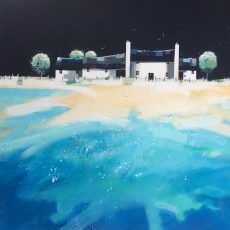 She uses a wide range of media to achieve the colours and contrasts typical of her work. 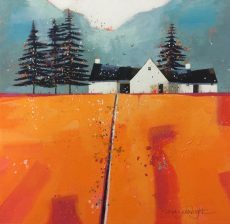 Dionne combines memory with imagination to produce paintings which play with perspective, colour and light. Seasonal changes in the landscape often inform her work. All of her paintings are elegantly framed in simple white tray frames. 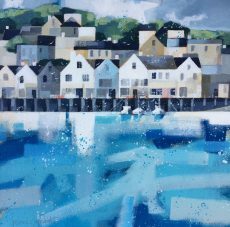 We have originals and limited editions of Dionne’s paintings in the gallery all year round. Dionne’s work also features regularly in our mixed shows.